Downtown Edmonton business and community partners are building the first downtown community playground, on the grounds of Historic McKay Avenue School at 10425 99 Avenue. The playground will provide much needed space for children to play and foster a safer, more attractive space for residents and the community at large. Edmonton Police Service, Edmonton Public Schools, City of Edmonton, Downtown Business Association, Downtown Edmonton Community League, Manasc Isaac Architects, and 104th Street Committee are working together to raise funds for the Historic McKay Avenue School Playground. 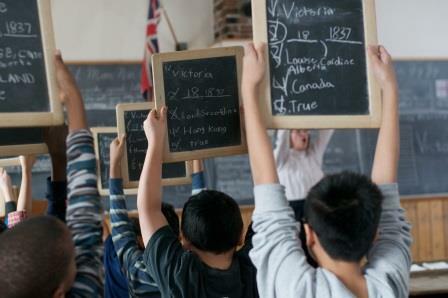 Housed within the oldest standing brick school in Alberta, our facility offers curriculum-based, hands-on programs for students; a museum highlighting the history of Edmonton Public Schools and Alberta's early political history; and archives where historically significant documents are preserved for future generations. Designated a Provincial Historic Resource in 1976 and a Municipal Historic Resource in 2015, McKay Avenue School has played an important role in the educational, social and political development of Edmonton and Alberta. It has been preserved to reflect the District’s past and to pass its history on to future generations. The Archives and Museum is a public research facility housing records and artifacts related to Edmonton Public Schools. Some of the holdings include: Board of Trustees meeting minutes, administrative records, attendance registers, school records, yearbooks, school cultural material, photographs, curriculum material, maps, authorized Alberta textbooks, student records, trophies, sports equipment and school furniture.